Even in a city that prides itself on its abundant parkland, the Tallahassee Chain of Parks stands out as something special. Extending east-west along five blocks in the heart of downtown, this urban oasis offers visitors a place to enjoy a little peace and quiet amid leafy shade and lovingly tended garden spots. Go on. Take a stroll or sit a spell on one of the park benches, take a gander at sunlight dappling through the majestic oak trees. Try to imagine how it could be any more wonderful. Every spring, the folks at the LeMoyne Center for the Visual Arts make it their mission to make the Chain even more gorgeous by filling it with more than 150 artists, artisans and craftsfolk from around the nation. With its dazzling array of original painting, sculpture, photography, ceramics, textiles, fine jewelry — and even a few quirky musical instruments — The Chain of Parks creative bazaar is an ideal place to find beautiful items to fill empty spaces in your house or garden or pick up a nice something-something for that certain someone you can never figure out what to give. Of the many artists traveling to Tallahassee from around the country, the festival is excited to welcome back wife and husband watercolorists Carmen Lagos and Gustavo Castillo. The couple from Jupiter, Florida, started their careers in the LeMoyne community. Gustavo met Carmen in his native Columbia. She had escaped the oppressive Pinochet government in Chile and was studying to become an architect. He had just earned his commercial pilot’s license. One day, Carmen suggested that he try out some of the painting supplies in her studio. He was hooked. Soon they had cast aside their more conventional professional aspirations and embarked on what has been a 35-year journey as full-time artists. It’s not hard to tell their works apart. Carmen’s palette tends to be darker and richer, where Gustavo favors a brighter range. They are both realist painters, but Gustavo employs broader gestures derived from abstract styles. In any case, the influence of one on the other is apparent. 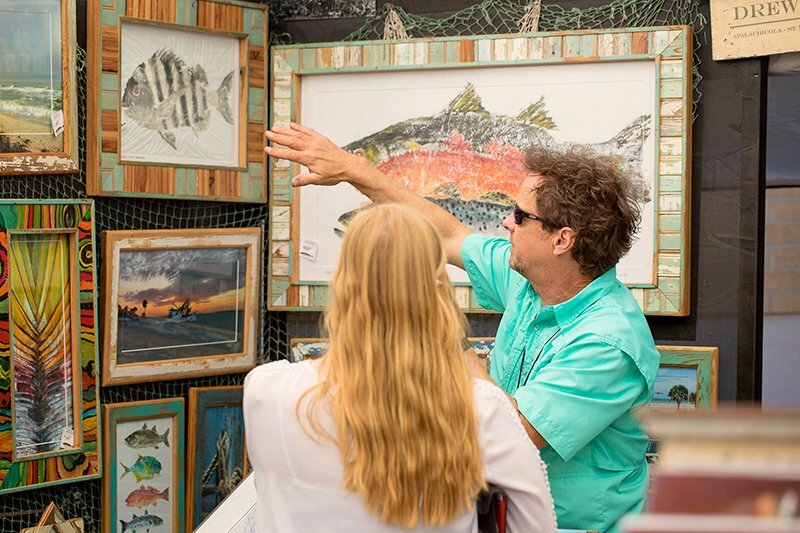 Festival-goers stroll among displays of fish rubbings, carvings, sculpture, paintings, photography, pottery and more. As if the visual feast were not enough, festival programmers have put together a bushel of top-drawer musical talent for the festival weekend. All day Saturday and Sunday, the Main Stage is a great area to rest your feet and enjoy a snack or a beverage from one of the local food vendors. There’s plenty of room to spread a blanket and let the kids romp free while you enjoy an iced tea or glass of wine and plan your next art purchase. On Saturday evening, artists and visitors alike can head over to the Main Stage to mingle and dance to the sounds of the festival’s headline performer, The Krickets. This self-described “swamp-folk girl band” from Port St. Joe, Florida, took home the International Music and Entertainment Association 2016 IMEA Folk Artist of the Year award and claimed the Folk/Singer Songwriter Song of the Year at the 2016 Independent Music Awards. If you like the sound of, say, Emmylou and Dolly and Linda harmonizing rich and tight, this could be the concert of the year. Catch them now, and in a few years you can tell everybody you saw them way back when. LeMoyne festival chair Kelly Dozier is inspired by the recognition, but she knows the festival means so much more to Tallahassee as a marker of community identity and engagement. 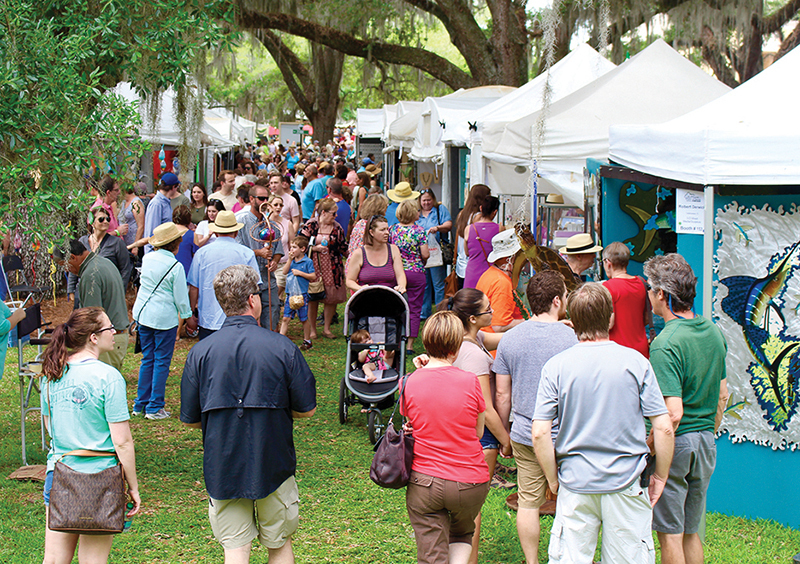 “I love how the excitement of art takes over downtown Tallahassee as the artists set up their booths in the parks. I am grateful to the hundreds of volunteers who come out to host artists and visitors making the festival enjoyable for all. And make no mistake: The economic bump is considerable. The Chain of Parks festival is the nonprofit LeMoyne Center’s most important fundraiser each year, accounting for a substantial portion of their annual operating budget. This two-day event helps make their ongoing education and exhibition programs a reality. For the community at large, the 2017 festival pumped an estimated $1.4 million of extra juice into the local economy. Thanks to the support of volunteers, sponsors and the city/county government, the LeMoyne festival proves yet again that support for the arts is a smart investment in Tallahassee. They may be riding high on success and recognition, but the folks at LeMoyne — and their army of committed volunteers and sponsors — are not resting on past triumphs. Because this year’s festival does not conflict with Easter Sunday, attendance could easily top 40,000. They are determined to make this the best fest yet.